Found 2 file extension associations related to Max Magic Microtuner and 1 file format developed specifically for use with Max Magic Microtuner. 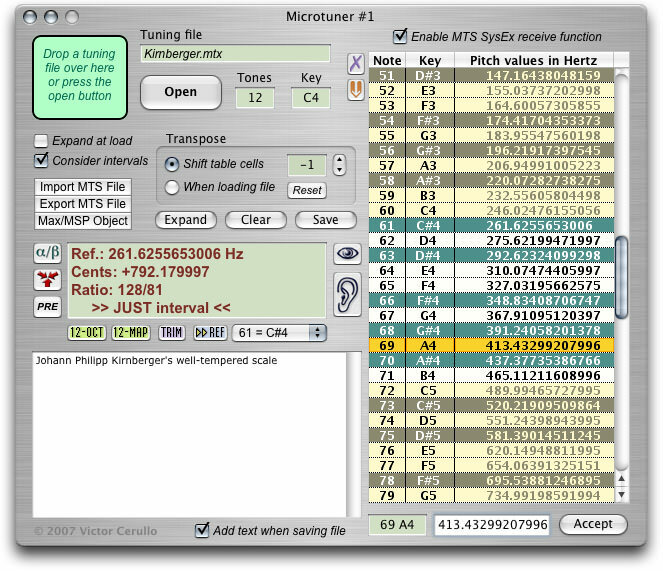 Max Magic Microtuner is a complete and versatile musical scale and tuning editor; it allows you to play, send and receive microtuning keymaps compatible with hardware and software synthesizers supporting the MIDI Tuning Standard format; it is compatible with Scala, Max/MSP, and Pluggo. If you need more information please contact the developers of Max Magic Microtuner (Yahoo, Inc.), or check out their product website.